Where to get up-to-date information and weekly suggestions? Where to get up-to-date information & weekly suggestions? Berlin is an incredibly busy city with events happening every single day. Should you find yourself with some time to spare, you’ll always be able to find something to do— from attending lectures to art exhibits to trendy restaurant openings. Use these links to help you on your way! – Ask Helmut is a nice website/App that gives suggestions according to your mood. They also have a very good list of Berlin’s cultural institutions. And Helmuts Liste enables you to win tickets! – The Savoteur newsletter keeps you updated on Berlin’s hype and yuppie scene. They focus on shopping and food, but have nice cultural suggestions. – In the same spirit, Stil in Berlin offers a newsletter, a guide and a map of Berlin’s best restaurants, shops and art galleries. – A third blog in this genre is Finding Berlin. – Ceecee is another weekly newsletter, check out their cultural recommendations. – The ExBerliner is Berlin’s most famous English-speaking magazine. They also have an event calendar. – Mit Vergnügen offers daily suggestions (in German) if you still don’t know what to do! – Meetup is a great place to find things to do in a group. Berlin fills the months with festivals and special events, ranging from art and film weeks to the famed Christmas markets in December. Read on to find out more about seasonal activities in the city. – You will find here a calendar of all film festivals, among which the famous Berlinale in February, but also countless independent ones, from the Feminist Film Week to the Turkish Film Festival! – For performing arts, check out this list. – The Days of Jewish Culture are a ten-day festival presenting the diversity of Jewish culture in Germany today, with theatre plays, readings, exhibitions, concerts, etc. – Musikfest is Berlin’s major classical music festival, organized during the first weeks of September. – LiederLauschen, a small but nice music festival takes place at Helmholtzplatz in Prenzlauer Berg during the second weekend of the month. – Last but not least, September is also the month of literature in Berlin, with the International Literature Festival. – The European Month of Photography, taking place every two years, is the largest German festival for photography. Countless exhibitions and vernissages in every galleries and museums. – The Festival of Lights provides a different perspective of Berlin’s monuments by night. – After the Berlinale, Interfilm – International Short Film Festival is Berlin’s second most significant film festival, and it is a unique opportunity to get to see short films from all around the world, and to meet actors and directors. – During the first week of November, a festival for jazz-addicts: Jazzfest. – December in Berlin is dedicated to the Christmas Markets… which, along with the commercial aspect, propose a lot of concerts and cultural events. Here is one of the many lists of all Weihnachtsmärkte, and here a useful map! – CTM – Festival for Adventurous Music and Art and transmediale festival focus on digital culture, notably on contemporary electronic and experimental music, in the context of sound and club cultures. – The Tanztage (Days of Dance) will give you the chance to discover Berlin-based up-and-coming choreographers and dancers. – About 400 films of every genre, length and format, mostly premieres: the Berlinale (Berlin International Film Festival) is not to be missed. Check out the program, for some sections (Generation, Forum…) you can easily get cheap tickets. – MärzMusik is a very unusual festival: ten days of concerts, installations, performances, film screenings and lectures, providing various ways of accessing the phenomenon of time. – Achtung is the third biggest film festival in the capital, dedicated to films that were (at least partly) filmed in and around Berlin. – FIND, the Festival of International New Drama, organized by the Schaubühne, offers plays from all over the world with English surtitles. 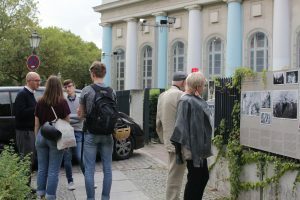 – During the first weekend of May, more than 50 galleries throughout the city open their doors, day and night, for the Berlin Gallery Week-End. – Theatertreffen: Since 1964, this festival selects the 10 best German productions of the year, that are then presented during two weeks in Berlin (don’t miss the opening of the box office if you want to get some tickets!). – Karneval der Kulturen: a true Berlin institution! It is a four-day urban festival taking place in Kreuzberg since 1996, which aims to reflect on Berlin’s diversity. – Berlin Biennale for Contemporary Art: organized by the KW Institute for Contemporary Art, it takes place every two years (2016, 2018…), usually during the months of May, June or July. It has become one of the most important events of contemporary art worldwide. – At the end of August, during the Long Night of Museums, up to 100 Berlin museums, collections, memorials and exhibition centres open their doors until 2 am. Berlin has a world-renowned system of state-funded museums ranging from Renaissance to modern art. Also popular are underground and DIY contemporary art galleries, many of which host free events and are a great gateway into Berlin art culture. – The collections of the National Museums are on display in 17 different locations and embrace the areas of European and extra-European art, archaeology and ethnology. No need to say that buying the annual pass is a good investment, as for only 50€ as a student you can visit them anytime you want, and you will be able to discover a variety of new temporary exhibitions each month. Otherwise, admission is generally around 5€. They have regular guided tours in English, and occasional lectures, concerts and events. 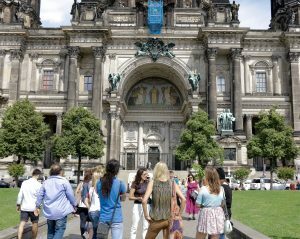 – Museumsinsel (Museum Island) is one of Berlin’s most attractive tourist sites, situated in the very heart of the city. The Alte Nationalgalerie was originally built to showcase German art, and if it has now expanded its collection to include 19th century art from a range of European painters, this is still an occasion to see great works by C. D. Friedrich, A. Menzel or M. Liebermann. The Bode Museum mostly hosts sculptures from the 13th-18th centuries and Byzantine Art, the Neues Museum is renowned for its collection of Egyptian art, while the Altes Museum is dedicated to classical antiquity and the Pergamonmuseum to Islamic art. – Directly in front of the Charlottenburg castle, two little museums display private art collections from the 20th century in beautiful neoclassical buildings. The Sammlung Scharf-Gerstenberg mainly offers Surrealist art, while the Museum Berggruen host works by Picasso, Klee, Matisse and Giacometti. – Contemporary art is to be seen in the vast Hamburger Bahnhof which focuses on art since 1960. The building, a former station, is worth visiting for its own architectural value. – Near Potsdamer Platz, the Kulturforum gathers several other institutions such as the Gemäldegalerie (paintings from the Renaissance), the gigantic Museum of Decorative Arts and the very small but interesting Kupferstichkabinett (Museum of Prints and Drawings). Berlin is an art lover’s paradise, not only because of its museums, but also because its gallery scene is unique, and offers multiple vernissages each week, a nice way to meet the artists and to get free drinks! To help you find your way, there are a few useful websites. Bpigs, for instance, is a guide which will keep you updated on all gallery openings and exhibitions currently on display. Galleries are listed and mapped here, and you can also subscribe to their newsletter. Index is another very useful map and calendar, or you can alternatively use this map edited by Berlin Galerien. – Most galleries are concentrated around two areas: Auguststrasse, in Mitte (easily reachable with the M1), and Potsdamer Strasse. – Haus der Kulturen der Welt offers a very interesting, international and interdisciplinary program of exhibitions and events: from visual arts to music, literature, and performing arts. – KW Institute for Contemporary Art, a former margarine factory, has come to be considered a symbol of Berlin’s development as an international centre of contemporary art. Entry costs 4€, on Thursday evenings you get a free guided tour. – Berlinische Galerie‘s outstanding collection of art dating from 1870 to the present includes Dada Berlin, the Neue Sachlichkeit (New Objectivity) and the Eastern European avant-garde. – You may also be interested in Me Collectors Room, Haus am Lützowplatz, the Deutsche Bank Kunsthalle (free on Mondays), the Daimler Contemporary, the Brücke Museum (German Expressionism, Aya Soika’s favorite! ), or an alternative exhibition space, the Bethanien Kunsthaus in Kreuzberg. – SAVVY Contemporary is a gallery in Wedding with many free events. As a space, it emphasizes postcolonial issues and non-Western artists. – If you like photography, you should visit the C/O Berlin, they have changing exhibitions. 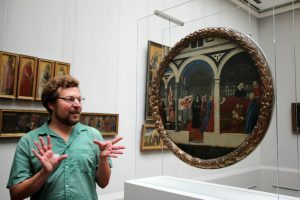 – The Martin Gropius Bau proposes a great diversity of temporary exhibitions, from contemporary art to photography, including ethnographic art, all together providing an unusual insight into cultural history. – The Bauhaus-Archive presents not only thematic exhibitions on the Bauhaus, but also regular exhibitions of contemporary design from the creative community. – There is a lot of public art to see on the streets, such as the East Side Gallery (and it’s free!). – If you want to learn more on Berlin’s history, visit the Märkisches Museum, admission is free on the first Wednesday of each month. Otherwise, the Museum in the Kulturbrauerei offers a free permanent exhibition showcasing everyday life in the GDR. And for more general German history, there is of course the German Historical Museum located in the former Prussian armory. – The Jewish Museum and its very famous building conceived by architect Daniel Libeskind are surely not to be missed (free as well!). – Another significant part of Berlin’s culture can be discovered at the LGBT Museum. – With its many film festivals throughout the year and its big Museum of Film and Television at Sony Center, Berlin is definitely a great city for film lovers. Have a look at Jazz Guide Berlin: they have a map with every jazz bar and concert venue, and provide a very exhaustive calendar of all jazz-related events in Berlin. Otherwise, this website provides a list of all locations. – Every last Thursday of the month the Museum of Musical Instruments near Potsdamer Platz hosts a free modern jazz concert. They bring innovative and highly talented artists, who offer exceptional shows. The museum also organizes regular concerts and events. – For high quality jazz concert, you should also try the free concerts offered by the Nordic embassies and their Jazzkantine (don’t forget to register online). – Near our campus, Speiches Blueskneipe in Prenzlauer Berg hosts the Roamer Street Ragband live on each Sunday night, for old Jazz classics. – During the week, for free Jam Sessions and concerts go to Schlot on Mondays, Edelweiss on Tuesdays, or to B-Flat or Zosch on Wednesdays. With eight professional orchestras, Berlin has long been the capital of classical music (before becoming the one of techno music…). – The world supremacy of the Berlin Philharmonic Orchestra is widely recognized, however it is not easy to get a ticket… Two very good tips for you: even if a concert is sold out, you can go to the ticket office and ask for a student ticket (15€ only! ), they keep a quota especially for under-28s! Then, the ‘Lunch concerts‘ on Tuesdays at 13:00 (be there at 12:30!) offer one free hour of classical (sometimes jazz) music, played by young but super talented musicians. – Alternatively, the Konzerthaus at Gendarmenmarkt is another institution. – Radial System is a former pumping station that now hosts classical concerts (mainly choir concerts), contemporary dance performances and visual arts shows. – Piano Salon Christophori in Wedding is as exceptional an experience as it is unexpected: some of the best musicians come to perform in this unique workshop-turned-venue. The walls are festooned with old piano parts, the atmosphere is warm and intimate, and it’s all donation based, so whether you are a classical music aficionado or not, you should try it (you have to register online before the concert!). – Every second Thursday of the month, the JaJaJa Sessions present the Nordic region’s brightest emerging artists. Three concerts for 5€ at a nice bar on the Spree. 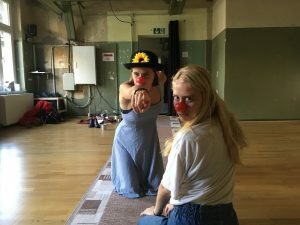 – An Einem Sonntag in August or Acud in Prenzlauer Berg, Madame Claude in Kreuzberg, Schokoladen in Mitte, Antje Öklesund in Friedrichshain, and 8MM are bars and venues where you can enjoy a variety of live concerts almost every day, typically for free or just a few euros. – Check out Festsaal Kreuzberg, Columbia Halle, and Musik und Frieden for a variety of larger artists that tour via Berlin. Berlin Bühnen takes inventory of all what’s happening on Berlin countless stages. You can choose your genre among drama, opera, concerts, dance, or performance, or have a look at their list of locations. Going to the theatre is a must in the city where Bertolt Brecht had his own company until his death in 1956. You can still feel his influence, and see very modern and innovative productions, as well as revisited classics. How much? Most theatres have student discounts, a ticket should cost you around 8-10€. You can sometimes buy your tickets directly online, otherwise you can call the ticket office or send an email. Don’t wait until the last minute! Tickets can generally be booked from the first day of the month before the show, and some good plays are sold out very quickly. – All plays at Maxim Gorki Theatre are performed with English surtitles. This theatre is very conveniently located near the terminus of the M1! – Likewise, the Deutsches Theater offers almost all plays with surtitles. – The Schaubühne is Thomas Ostermeier’s mythic company. Around 5 plays are offered with English subtitles each month. Since 2000, this theatre organizes a great festival in April, FIND, the Festival of International New Drama, which showcases plays from all over the world with English surtitles. – No need to say that you won’t need surtitles at the English Theatre, a small independent theatre located in South Kreuzberg. – The Volksbühne, located in Mitte, has been around for over 100 years. Along with its iconic architecture, it is known for a variety of experimental productions. Buying the ClassicCard (15€ for one year) may encourage you to see a lot of opera, ballets and concerts! Indeed, it enables you to get last-minute tickets for 8€ one hour before the start of the performance, at most of Berlin’s major venues: Deutsche Oper, Komische Oper, Staatsoper (opera), Konzerthaus, Deutsches Symphonie-Orchester, Rundfunk-Sinfonieorchester, Rundfunkchor, RIAS Kammerchor (concert) and Staatsballett (ballet). More details here. – Deutsche Oper, Komische Oper and Staatsoper are Berlin’s main opera houses. Students are eligible for a discount on tickets (25% at Deutsche Oper, 50% at Staatsoper). – Neuköllner Oper is a nice alternative to the aforementioned institutions: it has surtitles for some shows and tickets cost only 9€ for students. – The Sophiensæle in Mitte, the Dock 11 in Prenzlauer Berg, the Hebbel am Ufer or the Ballhaus Naunynstrasse in Kreuzberg are independent performance spaces that host regular contemporary dance shows, modern art installations and performances. – Clärchens Ballhaus in Mitte is Berlin’s most famous ballroom, which has been attracting hundreds of people of all ages each night for more than a century. Salsa, Tango, ChaCha, Swing… you can try it yourself or just enjoy watching other people dance. The place may seem familiar to you: a scene from Tarantino’s Inglourious Basterds was shot there! – Every Tuesday night, at the karaoke bar Monster Ronson’s Ichiban Karaoke, the performance group House of Presents hosts a drag show. – There are plenty of nice, gemütlich,independent movie theatres in Berlin, and they often screen films in English or with English subtitles. Check this website that offers a map and a program! Very accessible from campus, you will appreciate Acud Kino and Lichtblick Kino, two small and cozy cinemas in Prenzlauer Berg, or Hackesche Höfe Kino in Mitte, Wolf Kino in Neukölln, B-Ware! Laden Kino in Friedrichshain or Kulturfabrik Moabit, which is located in a former factory. – If you prefer a big multiplex, the CineStar at Sony Center generally screens movies in the original English version. – Yorck Kinos is a group of cinemas across Berlin. Their network includes the Kino International (check out their event MonGay, where a queer movie is screened every Monday night). – In the warmer months, Freiluftkinos (open-air cinemas) are not to be missed. There are various locations, including in Kreuzberg, Friedrichshain, and other neighborhoods. – To see old classics and rare author films, try the Arsenal, they offer over 1000 screenings each year! Many institutions across Berlin host a number of free or low-cost academic events. Attending a few of these is a good way to meet people across the city and to expand your academic horizons beyond the classes you are taking this semester. – The American Academy has interesting public lectures and readings in English, don’t forget to register online a few days in advance. – The Heinrich Böll Stiftung hosts regular lectures, workshops and conferences on various topics (Democracy, Education, Ecology, Economic & Social Issues, International Politics…), some in English or with subtitles. – The Berlin Institute for Cultural Inquiry in Prenzlauer Berg also offers some lectures in English. – Check out the program of the Freie Universität, or of the Berlin School of Mind and Brain of the Humboldt Universität, as they also have English-language events. – The Rosa Luxemburg Stiftung hosts a variety of lectures, often on topics such as workers’ rights, women’s rights, anti-fascism, and anti-racism. – To find information on places to buy books, libraries around the city, or how to access ebooks, among other tips, consult the Library Wiki. From morning through night, Berlin is abuzz with interesting events. Below are some favorite suggestions of BCB students to either unwind during the day or to dance and listen to music in the evening. These events offer ways to experience the diverse scenes of contemporary Berlin. – Slow food is the new rising trend in Berlin: you can find regular street food markets at Kulturbrauerei in Prenzlauer Berg, Markthalle Neun in Neukölln, Neue Heimat in Friedrichshain, and regular events such as the Vegan Green Market at Arena Park. – Berlin caters to many interests, both by day and by night. Resident Advisor is a way to stay updated on many evening offerings around the city. – For an alternative to techno and house, St. Georg offers a selection of R & B and hip hop tracks. Alternatively, Gretchen is a Kreuzberg-located club with live music and DJs, among other things. – SO36 is a punk club and Berlin institution that has hosted the likes of David Bowie and Iggy Pop, among others. Check out their Rollerdisko evening that happens once a month! – Not sure where to go tonight? Try this quiz! 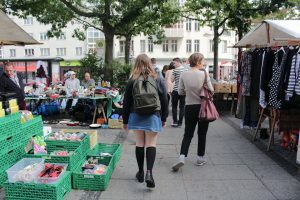 – Flea Markets: Another classic Berlin pastime, because what else are you going to do on a Sunday? Try this one at Boxhagener Platz, this (classic) one at Mauerpark, or this one by the Spree in Neukölln. – Find information about civic engagement and volunteer opportunities in Berlin here.